A regular breeding species and permanent resident. The European Starling was an abundant species during the Minnesota Breeding Bird Atlas (MNBBA). Global in distribution, the European Starling now occurs throughout North America, from southeastern Alaska east to northern Quebec and Labrador and south throughout the United States. Breeding concentrations are highest in the north-central United States (Figure 1). Introduced to North America in the late 1800s, this non-native species is not a conservation concern. It causes damage to agricultural crops, poses safety concerns at airports, and aggressively outcompetes many native species for nesting cavities. Although the European Starling is largely considered a sedentary, permanent resident, many of the birds do migrate. This is particularly true of more northerly populations, including those in the Great Lakes region and the Midwest. The migratory movements of the species have not been well studied. Omnivorous, foraging in open areas such as lawns in urban spaces and pastures in agricultural regions; considered an economic pest. An adaptable cavity nester; potential sites include former woodpecker cavities, natural cavities, cliffs, burrows, nest boxes, and anything resembling a hole or cavity in any building or structure. Breeding distribution and relative abundance of the European Starling in North America based on the federal Breeding Bird Survey, 2011–2015 (Sauer et al. 2017). A common species throughout Eurasia, attempts to introduce it to North America began as early as 1872. At least six attempts were made in cities across the country, each successively failing before the species took hold in New York City’s Central Park. Implemented by a group of Shakespeare enthusiasts who were committed to having each species the playwright ever mentioned in his plays present in North America, a total of 100 starlings were released over a period of two years from 1890 to 1891 (Cornell Lab of Ornithology 2016). The rest is history. By 1916, the European Starling ranged from southern Maine to Virginia; by 1931 it had been sighted at Churchill, Manitoba, and by 1942 the first flock was reported in California (Bent 1950). A whole colony of these birds was found in a cupola of a barn on a farm in the eastern part of Fillmore County. The people who own the barn have been observing these birds for at least two years. During the last four years the Starling has spread throughout Minnesota and westward into the Dakotas. It is nowhere as abundant, as yet, as farther east, but since it is now well established and nesting regularly, it will not be long before it will be an all too familiar bird about our cities and towns. Roberts’s prediction proved all too true. Forty years later, Green and Janssen (1975) noted that the species was already statewide in distribution by the end of the 1930s, although its abundance did not surge until the 1940s. Most common in Minnesota’s open farm country, the species had even been reported in the Boundary Waters Canoe Area Wilderness. Janssen (1987) included a statewide distribution map that identified 34 counties where nesting had been confirmed since 1970. Hertzel and Janssen (1998) later added 9 more counties to the list. During the Minnesota Breeding Bird Atlas, participants reported a total of 4,055 European Starling records from 46.5% (2,252/4,844) of the surveyed atlas blocks and from 59.5% (1,390/2,337) of the priority blocks. Breeding evidence was confirmed in 1,026 (21.2%) blocks (Figures 2 and 3; Table 1). Widely distributed across the state, the species was least common in north-central and northeastern Minnesota. Regardless, it was reported from all 87 Minnesota counties and was confirmed nesting in all but 1 county, Lake of the Woods. Overall, the European Starling was the thirtieth most commonly reported species during the atlas and ranked ninth in terms of confirmed nesting reports. The MNBBA predicted breeding distribution map predicted moderate breeding densities to occur throughout the settled and agricultural regions of southern and western Minnesota (Figure 4). The species was predicted to be absent or present in low breeding densities throughout much of the Laurentian Mixed Forest Province, with the exception of settled and developed areas such as Duluth, Brainerd, Bemidji, International Falls, and the Iron Range. The area of predicted abundance in northern Cook County is the site of the 2007 Ham Lake fire on the north end of the Gunflint Trail. Since the species’ rapid spread across North America in the early 1900s, local populations have fluctuated in abundance, but the species’ overall distribution has remained relatively unchanged. Yet in his comprehensive review of the species, Cabe (1993) noted that it may still be expanding slowly along the northern and southern peripheries of its breeding range. Breeding distribution of the European Starling in Minnesota based on the Breeding Bird Atlas (2009 – 2013). Summary statistics of observations by breeding status category for the European Starling in Minnesota based on all blocks (each 5 km x 5 km) surveyed during the Breeding Bird Atlas (2009-2013). Summary statistics for the European Starling observations by breeding status category for all blocks and priority blocks (each 5 km x 5 km) surveyed during the Minnesota Breeding Bird Atlas (2009-2013). Predicted breeding distribution (birds detected per 10-minute point count) of the European Starling in Minnesota based on habitat, landscape context, and climate data gathered during the Minnesota Breeding Bird Atlas (2009-2013) using the General Linear Modeling method without an adjustment for detectability. The European Starling has two primary habitat requirements: suitable nest cavities and open areas with short vegetation for foraging (Cabe 1993). Both requirements are easily met in a wide range of diverse habitats, especially in developed areas (Figure 5). Buildings provide an endless supply of creative nesting opportunities, and farmland or residential areas provide an abundance of foraging opportunities. In Minnesota, the European Starling avoids dense forest cover and large areas of open vegetation, such as expansive peatland and grassland landscapes. It reaches its highest breeding densities in the agricultural regions of the state and in southeastern Minnesota (Figure 1). Habitat data collected within 200 m of MNBBA point counts where the European Starling was detected demonstrate the species’ strong association with development and croplands (Figure 6). Typical breeding habitat of the European Starling in Minnesota (© Lee A. Pfannmuller). Habitat profile for the European Starling based on habitats within 200 m of point counts where the species was present during the Minnesota Breeding Bird Atlas (2009-2013). Data gathered by the federal Breeding Bird Survey (BBS) have been used to generate a North American population estimate of 57 million birds (Partners in Flight Science Committee 2013); the population estimate for Minnesota is just a little under 1 million birds (950,000), or approximately 1.7% of the North American population. A statewide estimate using MNBBA data was not generated. Although it is an abundant species in Minnesota, significantly higher breeding densities are reported further east. In Minnesota, an average of 49 birds per BBS route has been reported in the state each year. Twice as many are observed in Iowa (116 birds per route) and Wisconsin (111 birds per route); Indiana reports an average of 317 birds per route (Sauer et al. 2017). Despite its abundance, the European Starling has experienced a steady decline since at least the mid-1960s, when the federal Breeding Bird Survey began monitoring landbird populations. Survey-wide, it has experienced a significant decline of 1.46% per year since 1966 (Sauer et al. 2017). In Minnesota the decline has been slightly steeper, averaging 1.75% per year from 1967 to 2015 and 2.27% per year since 2005 (Figure 7). Factors responsible for the decline likely relate to the loss of agricultural pastures that are necessary for feeding. Some of the largest and most geographically extensive declines have been in the northeastern United States and southeastern Canada, as farmsteads and adjacent pasturelands have been abandoned and replaced by forest cover. For example, in southern Ontario, the European Starling decreased 13% between Ontario’s first atlas, conducted in the early 1980s, and its second, conducted 20 years later. The loss of pastureland was considered the most important contributor to the decline (Cadman et al. 2007). 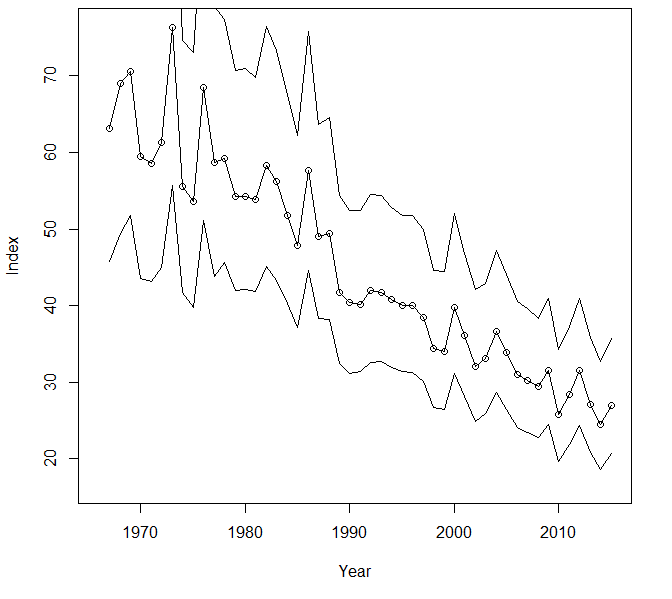 Breeding population trend for the European Starling in Minnesota for 1967–2015 based on the federal Breeding Bird Survey (Sauer et al 2017). Even though it is experiencing a significant, long-term population decline, as a nonnative species the European Starling is not considered a conservation concern. It is not protected under the Migratory Bird Treaty Act. Efforts have instead focused on limiting some of the economic damage it causes to crops, orchards, and livestock feed, albeit with limited long-term success. At least one study estimated the species’ annual damage to U.S. agriculture at $800 million (Pimentel et al. 2000). This includes losses to grain crops, fruit crops, and feed at livestock facilities. Control efforts also focus on large roosts located in urban areas, where the species’ presence can create noise, odors, and safety concerns, including at airports (Linz et al. 2007). In addition to these economic and safety concerns, the European Starling’s aggressive competition for nesting cavities is often cited as a factor contributing to the decline of other cavity-nesting species. Regardless, this adaptable, aggressive species will likely remain a major component of Minnesota’s avifauna for years to come. Even changing climate conditions, considered a threat to many North American birds, are unlikely to deter the starling. [its] enormous increase, rapid spread, gregarious habits, vast, noisy, and filthy roosts often in the heart of cities, usurpation of the nesting places and food of our native birds, quarrelsome nature and destructiveness to crops. Nonetheless, he foresaw a time in the future when, following its initial rapid growth and spread, the European Starling population would gradually decrease in numbers and its condition would be reduced to that of “innocuous desuetude.” Indeed, although the species is widespread throughout the cities, towns, and open country of North America, it does not elicit nearly the concern that it did when it first appeared. There is now an acceptance of its inevitable presence in the landscape. Linz, George M., H. Jeffrey Homan, Shannon M. Gaulker, Linda B. Penry, and William J. Bleier. 2007. “European Starlings: A Review of an Invasive Species with Far-Reaching Impacts.” In Managing Vertebrate Invasive Species: Proceedings of an International Symposium, edited by Gary W. Witmer, Will C. Pitt and Kathleen A. Fagerstone, 378–386. USDA/APHIS/WS, Fort Collins, CO: National Wildlife Research Center. Morse, Marius. 1933. “The Starlings Arrive.” Flicker 5: 16–17. Pimentel, David, Lori Lach, Rodolfo Zuniga, and Doug Morrison. 2000. “Environmental and Economic Costs of Nonindigenous Species in the United States.” BioScience 50: 53–65. Thompson, Milton D. 1936. “The Immigration of the Starling in Northeastern Minnesota.” Flicker 8: 49.